The All Seeing Eye Sees All: Because I am a devotee of Nethys the All Seeing Eye, my powers of observation are divinely enhanced; I may use Arcane + Divine instead of Focused to notice or perceive things, and I can sense things that require mystical awareness to detect. Spell Adept: Because I am particularly good at casting a small selection of spells that I have an affinity or appreciation for, I may choose a number of spell write-ups equal to my current (Clever + Careful + Arcane). I gain +1 when casting any of the selected spells. Baraket (-2): Because I am in possession of a powerful blade of ancient provenance, I weild Baraket...the Sword of Pride. Cut Through Illusion: Because I hold power over magical illusions, my wielder gains +4 when they attack, defend, create advantage, or overcome vs a magical illusion. As a artifact, Baraket is indestructible by mundane means. Skoth is a servant of Nethys dedicated to self-mastery of the disparate arts of magic and swordsmanship. He is big on being mysterious, tries to cloak the full range of his capabilities as a surprise for the unwary, and keeps his own counsel. Recently, Skoth was put on the path of seeking out arcane artifacts associated with the Runelords of ancient Thassilonia, some of which have been lost to history for 10,000 years. After a harrowing adventure, Skoth recovered the power Shard of Pride and the Sin Sword of Pride, Baraket. He now seeks the rest of the Shards. Skoth carries sufficient walking around monies to deal with expected expenses, as well as a bag of small loose gems for when that is not enough, and finally letters of credit from the Cathedral of Abadar bank in Magnimar totalling to 700 gp which are accepted in urban areas where the church of Abadar has a presense. Skoth wears expensive robes with a hooded mantle, a master crafted but well-used sword with a hint of the exotic, a masterwork dagger with a small emerald pommel button, high-quality and comfortable swordsman's boots. Recently he has also acquired a crossbow (a rather inelegant but inarguably pragmatic weapon) and a double handful of bolts, 6 finely balanced darts, a smokestick, some silk rope and a grappling hook. 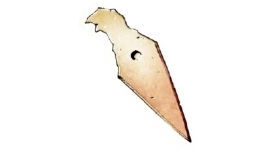 Skoth discovered a pendant (Pendant of the Souk) upon the skeletal remains of some previous delver of the Tower of the Crow; he senses that it has some importance but has not yet figured out what it is. Skoth makes a habit of stockpiling consumables like potions, scrolls, and alchemical items to aid him in his adventures and always seems to have a few on hand. Create advantage while Cleverly Arcane vs an Average (+1) difficulty to attach the spell Aspect I'm So Blurry to myself. While this Aspect is active it is difficult for opponents to see or target me clearly, and all attempts to notice me via sight or directly affect me suffer a -2 penalty; this does not work against area affecting abilities. I may invoke this Aspect to gain a bonus on actions where my blurriness and indistinct outline benefit me, such as to defend against attacks or to avoid being recognized. This item requires Divine +1 or better to use. Create advantage while Carefully Divine vs an Average (+1) difficulty to apply the spell Aspect Protection From Harm to myself or someone else in my zone. While this Aspect is active the person it is attached to can justify defending against all abilities that would cause physical or magical harm used by those with an outlook or innate nature that is at odds with my faith and my diety's purview. Additionally, the recipient of the spell Aspect gains +2 when attempting to overcome mind-affecting effects. This Aspect may also be invoked to offer further protection when defending from physical or magical harm. The Aspect lasts for a scene or until no invokes remain. Skoth has finally developed the ability to freecast Arcane spells, and can attempt just about anything. Create advantage while Cleverly Arcane vs an Average (+1) difficulty to create a spell Aspect on myself called True Strike for one (1) scene or until all invocations are used. I may invoke this Aspect to improve my aim when making magical or physical attacks. Create advantage while Quickly Arcane vs an Average (+1) difficulty to create a spell Aspect on myself called Expeditious Movement for one (1) scene or until all invocations are used. I may invoke this Aspect to move one additional zone or to gain a +2 bonus to overcome obstacles to my movement. Create advantage while Carefully Arcane vs an Average (+1) difficulty to create a spell Aspect on myself called Arcane Stealth for one (1) scene or until all invocations are used. While this Aspect is active I am more stealthy than I normally am. I may invoke this Aspect to grant myself +1 Sneaky for three (3) consecutive exchanges. Though Skoth only has Divine +1, he serves Nethys, the god of Magic, who finds favor in Skoth's Arcane pursuits and service. Nethys grants Skoth the following Divine Spell. It is the only Divine Spell Skoth may cast at his current level of skill. Because I am a Magus of Nethys, I may add my Arcane capability as a bonus when casting this spell.